We have a wide range of double glazed doors available, from composite and uPVC doors to patio doors, French doors and many more. The front door is the most used product on any home and the first thing people will notice when visiting. Create a memorable impression with the wide range available from First Home Improvements, all with a 10-year warranty (insurance-backed). Available in a selection of solid colours or woodgrain finishes. They also come with glazing options such as double or triple glazing, resin and glass bevels, lead and film, Georgian grill or sandblasted glass. We have a huge range of decorative glass designs to suit your home, along with the choice of door furniture such as handles, spy/peep hole and letterboxes. 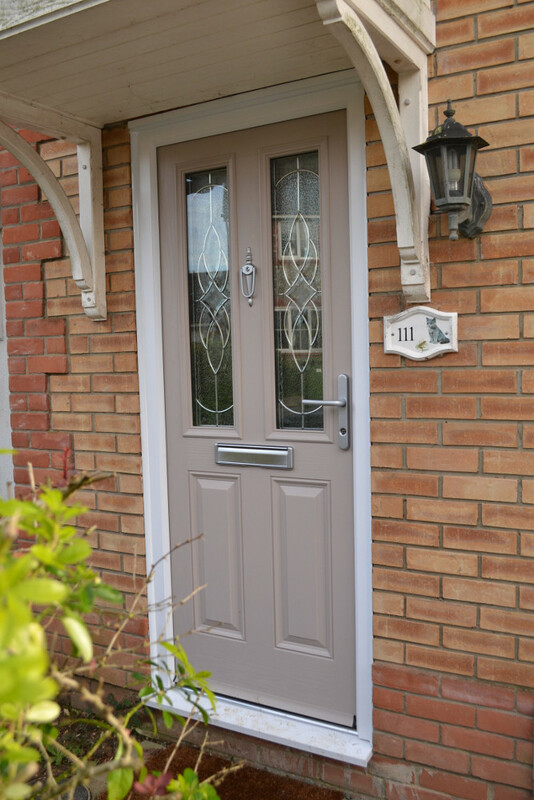 Our range of composite double glazed doors combine the very best handcrafted door designs with precision engineering, your composite doors from First Home Improvements are guaranteed to be the envy of your neighbourhood. 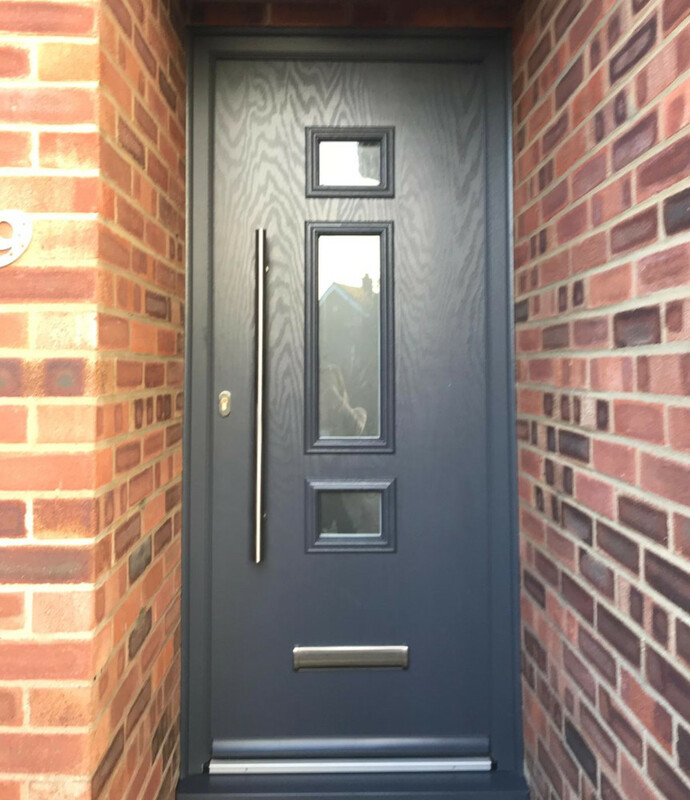 Manufactured using realistic grain design with reinforced outer texture, our industry-leading composite doors are the closest in appearance to woodgrain without the maintenance requirements. 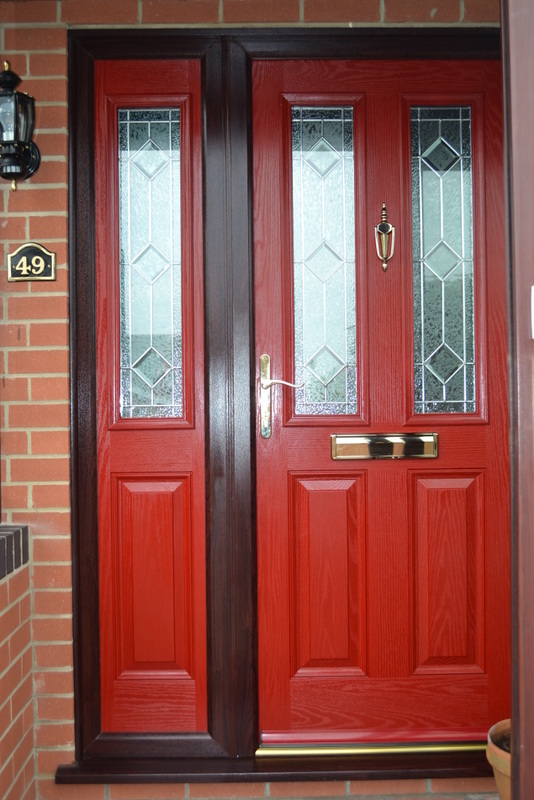 Unlike a traditional timber door, composite doors will not rot or warp, and benefit from durability and easy maintenance. 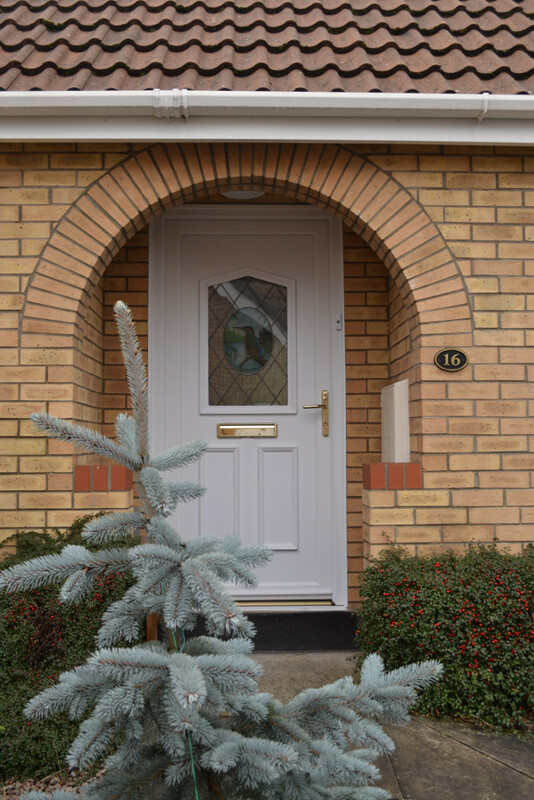 Our PVCu/uPVC doors are available in a wide range of designs and finishes to suit your complete installation. With a choice of full panel, half panel, side panel designs and double glazing options, you have the flexibility to choose the right design for privacy and light. Available in PVCu/uPVC or composite, the stable door designs are available in a range of styles, designs and colours to suit your home. All complete with FIRST FOR SECURITY. Choose from our wide range of Doors, offering high security, A+ energy efficiency and availability in a multitude of styles, colours and finishes to enhance the look of your home. All our double glazed doors feature energy-efficient glazing and high security 11 point locking system as standard. Keeping you, your family and your property safe. From traditional cottage styles to contemporary homes, all windows and doors are available with a wide choice of handles and hardware to perfectly suit your home. Tested to more than 30,000 cycles and up to 42 years of use, long lasting with a 10 year warranty. Rigorously tested to BS7950 and beyond. There isn’t enough room to present all the combinations and benefits of our double glazed windows and doors here, so feel free to request a quote with any questions and for us to provide more details of the full range. 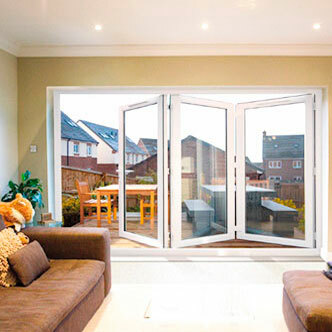 Pictured is an example of our bi-fold doors. Also see our double glazed windows range. We do every style of door you can think of! To find out more about our range of doors, then please contact us for a quote. Our range of uPVC doors are all supplied and fitted by us, if there is something unique you would like to discuss, then please contact us. The double glazed doors we supply will stay looking good for many years to come. 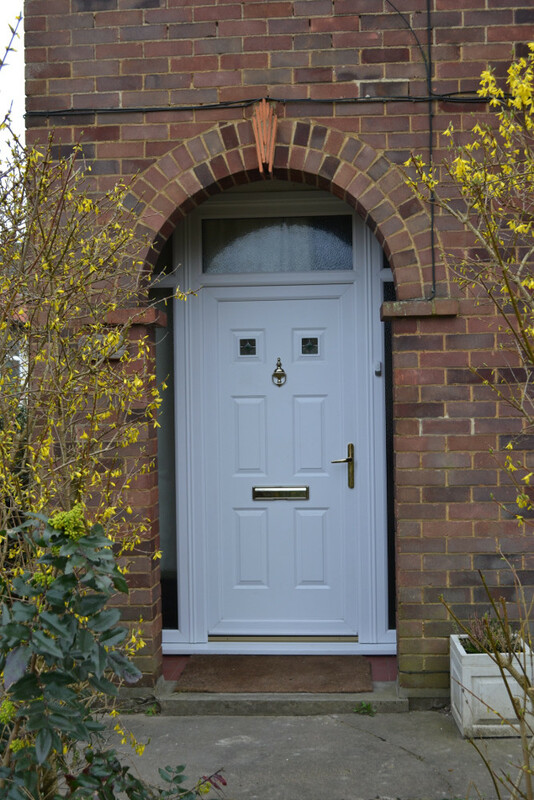 Each side of our front doors has a 2.5mm outer skin made from glass reinforced plastic (GRP). This outer skin acts as a weather shield that protects the door. 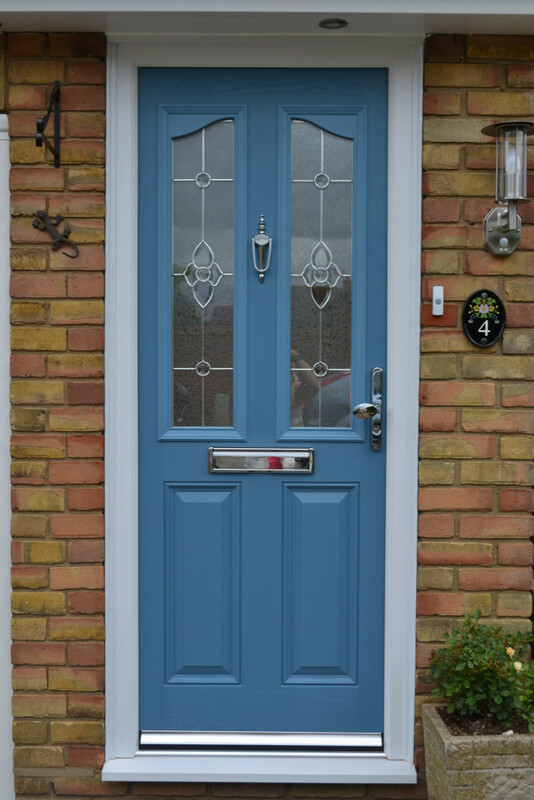 A composite front door, and double glazed frames and fittings, will never need painting, they won’t rust, and they’re resistant to weathering. That’s why we can guarantee them for 10 years. To keep your door looking new, and the colour as good as the day it was installed, it just requires an occasional quick clean with a damp cloth. That’s low maintenance for you. A composite double glazed door protects your home with the latest security measures. Both the door and the frames are constructed from tough, rigid materials. Add to this the multiple locking system and you can see how a composite door from First Home Improvements forms a secure barrier that shields your home. 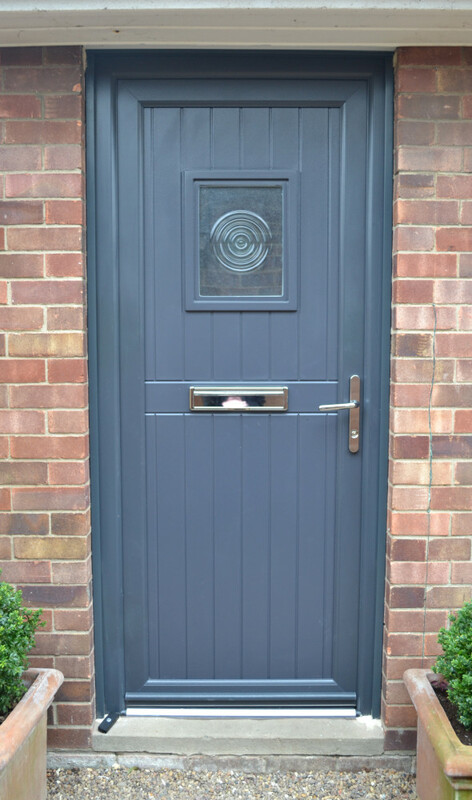 Contact us to find out more about our complete range of front doors, we have so many available to display on our website. Talk to us about the appearance you want for your home. Our advisers are happy to visit you and survey your property and guide you to the best decisions. Request a quote today and make upgrading your exterior doors easy. When you have to be inside but you want to connect with the open air environment outside, stable doors are the answer. Maybe you want to let the heat out of your kitchen, or the spring breeze into your study. A stable door can transform the character of any room and make it a joy to be in. Stable doors come in a number of different styles, including double glazed. 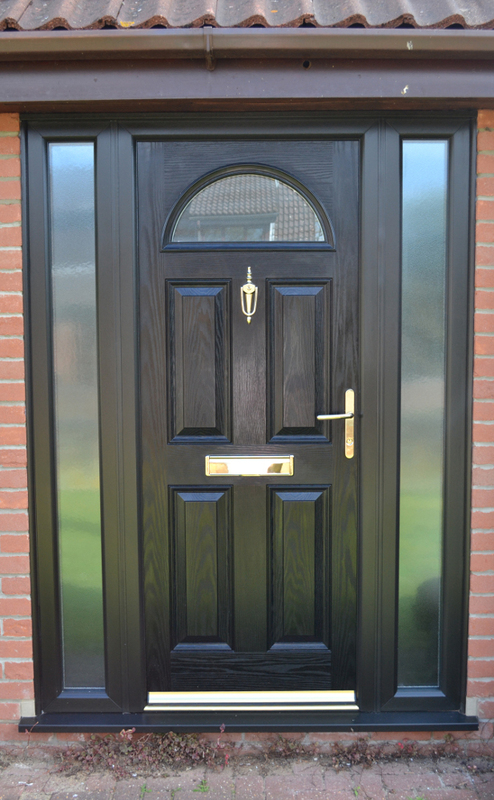 Various glass designs and a selection of bottom of panels allow you to combine the traditional stable door aesthetics with modern performance and security. A wide range of colours and finishes will complement the external and internal surroundings and decor. Maybe you’ve not considered stable doors for your home but are now thinking they could offer a new appeal to some rooms. We can help you to select the right combinations and get the feel and appearance of the room just as you want it. Contact us today and let’s get started. When you throw open your French doors you invite the garden, patio, balcony, or natural wide open views, into your home. Your kitchen, lounge, or dining room, will become one with the outdoors. 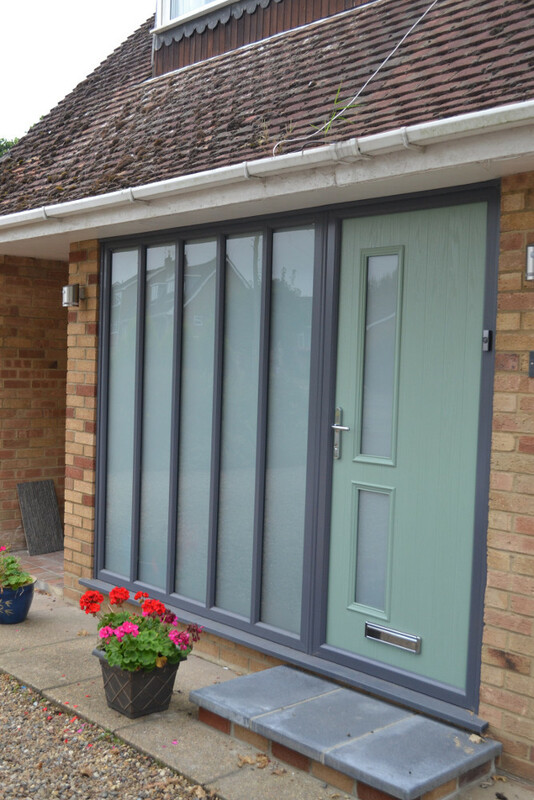 These beautifully made doors come in a range of styles, colours and finishes that gently blend in to any room while creating a secure barrier to the external elements when closed. You can choose from traditional window style doors to modern fully double glazed designs. 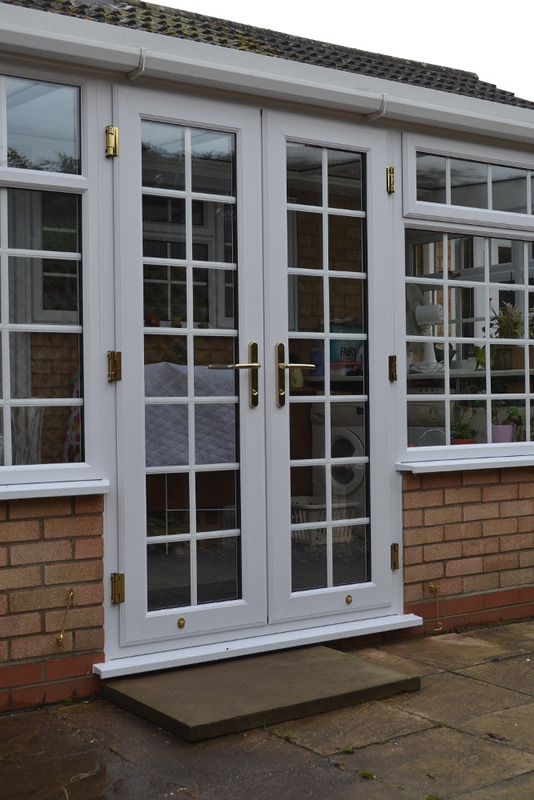 Our French door styles offer you high security and low maintenance, as well as effective energy performance. And just like our other products, there’s a 10 year guarantee to give you peace of mind. The above are examples of some of the most popular doors used in the most prevalent situations. For every room that opens to the outside, we have an assortment of solutions that help you to customise your home. 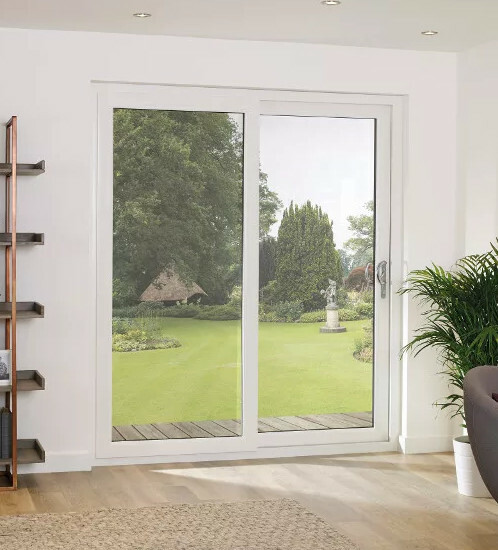 Patio doors, French-style doors, and bi-fold uPVC doors, are a great way to open up a room and make it part of the outside spaces around your home. Rear single door entrances require the same high security and heat efficiency that your front door has, plus a pleasing appearance. At First Home Improvements we have all the options to achieve this. At First Home Improvements we offer you options on designs, styles, and materials. We also offer you a free survey and adviser service to help you to work your way through these options and combinations. Our adviser will meet with you, and after looking at your property, they will listen to your requirements and guide you to the most beneficial choices that will meet all your requirements. To meet with a First Home Improvements adviser contact us today.